I guess the clue was in the title. It never quite all came together. Intriguing characters, each with his or her own story came and went…and never returned. 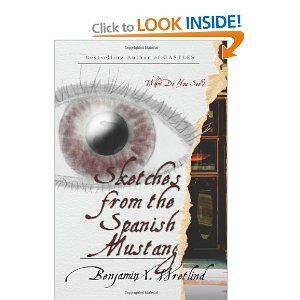 Only reading the author’s notes at the end did I realise that Sketches From the Spanish Mustang was indeed a collection of stand-alone novellas. There was never the intention for a rounded story in the traditional sense. The background for each of the sketches is the former mining town turned gambling centre Cripple Creek in Colorado, a place the author clearly knows well. Crumbling boom town buildings saved by the tourist dollar. The decaying pitheads on the outskirts of town, the descendants of the miners’ burros roaming the environs in the shadow of the inhospitable hills, all expertly conveyed to the reader. The glue holding the sketches together is the Artist, herself a tortured soul following the death of husband and son many years before. She blames herself and finds herself in a purgatory, condemned to sketch similarly troubled individuals until she is ‘released’. She sits outside the Spanish Mustang Casino and, sensing favourable subjects, commences to sketch. We meet a former miner having lost his self-respect drawn into domestic killings sparked by money and jealousy; the Indian drunk who speaks with a boy ghost; the touching story of a mother and her wayward teenage daughter, a brain-damaged war veteran and the middle-aged waitress never able to find refuge from an abusive past. The best sketch ought to have been left until last; instead the story of Fulano opened the book. An illegal immigrant seeking his fortune to support his family is granted his life on the journey across the border only for the bargain to come home to roost in Cripple Creek. A lovely piece of storytelling. Writland is a good writer, no frills or fancy imagery, with the sense of how a good story works. I’d just have preferred to have known up front that it was a collection. Roy, I agree. It’s a disappointment when you’re expecting one thing but get another. Or frustrating to know that confusion could have been spared with a quick line. How do you pick which books you’re going to review? Hiya Deb. This one I did for The Masquerade Crew, who give you a pick list. To be honest, once I’ve discounted all the sci fi and fantasy that people seem to be writing there’s not a whole lot left! The others I’ve done previously have been by author-bloggers I follow. I’m not sure if I’d have the heart to write a bad review though. On the same, kindly, basis, I’ve just voted on all your Amazon reviews to say that they are helpful, even the ones I’ve not read. Maybe it was just me being slow on the uptake Dianne. Maybe the title would have been enough for most.